Graphical representation of a Link between different Glyphs. This correspondents to the sbml ReferenceGlyph. Definition at line 75 of file CLReactionGlyph.h. 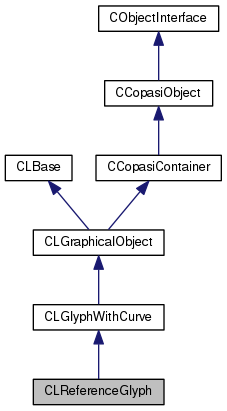 Definition at line 107 of file CLReactionGlyph.cpp. Definition at line 114 of file CLReactionGlyph.cpp. Definition at line 114 of file CLReactionGlyph.h. Definition at line 107 of file CLReactionGlyph.h. Definition at line 167 of file CLReactionGlyph.cpp. References CKeyFactory::get(), CCopasiRootContainer::getKeyFactory(), and mGlyphKey. Referenced by CCopasiSpringLayout::finalizeState(), operator<<(), and CCopasiSpringLayout::potGeneralEdge(). Definition at line 110 of file CLReactionGlyph.h. Definition at line 154 of file CLReactionGlyph.cpp. References mGlyphKey, mRole, and CLGlyphWithCurve::operator=(). Definition at line 225 of file CLReactionGlyph.cpp. Definition at line 108 of file CLReactionGlyph.h. Definition at line 112 of file CLReactionGlyph.h. Referenced by CLayout::CLayout(), and CCopasiSpringLayout::createLayout(). Definition at line 82 of file CLReactionGlyph.h. Referenced by getTargetGlyph(), getTargetGlyphKey(), operator=(), and setTargetGlyphKey(). Definition at line 83 of file CLReactionGlyph.h. Referenced by getRole(), operator=(), and setRole().